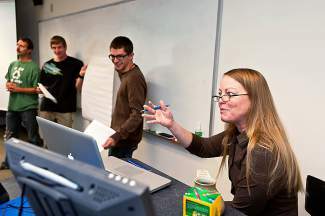 In this 2012 photo, Tina Evans, associate professor of sustainability studies at Colorado Mountain College, lectures at a sustainability class. The Breckenridge and Dillon campuses of Colorado Mountain College have seen student enrollment grow faster than at any of the college’s other facilities. CMC will allocate more financial resources to the county in its 2015-16 budget as well as bring on two new, full-time faculty members. The growth also means infrastructure challenges for the Summit County combined campus. Those instructors don’t have offices yet, as the Breckenridge building has run out of space. CMC will also commission a housing study this summer to analyze the needs and impacts of constructing housing — likely for employees — near its campuses in Summit and others without residential facilities. In its draft budget for 2015-16, CMC has proposed to spend roughly 6 percent more than it budgeted for this year. The new budget, which has total operating expenditures of $59.5 million, is again balanced without the use of reserves, with one exception. CMC’s budget for its bachelor’s degree programs will draw modestly from a designated phase-in reserve, which was set aside for that purpose, as the college adds two bachelor’s degrees to its current three in the fall. The college’s Board of Trustees will vote on the budget at its June 18 and 19 meeting at the CMC campus in Spring Valley, Colorado, as part of a regular rotation of meetings throughout the college’s 11 learning locations. Summit County property owners will pay slightly more as values have gone up. They can expect to pay about $32 per $100,000 of residential value and $116 per $100,000 of commercial value. Property taxes provide about three-quarters of CMC’s revenues every year, and the college’s vice president for fiscal affairs, Linda English, said CMC hasn’t asked voters for a tax rate increase in at least 25 years. The college’s general-fund revenues in 2015-16 will be slightly higher than the year before, or about $6.4 million more, due to increases in each of local taxes, state funding and net tuition. After property taxes, tuition and fees form the second-largest source of revenue for CMC, budgeted for this year at 16 percent, while state funding provides 11 percent of the college’s revenue. CMC receives property-tax revenue about 18 months behind, so English cautioned that the college’s figures don’t reflect real-time value. In the proposed budget, CMC is expecting to benefit from 10 to 20 percent increases in property values across its six-county taxing district. Summit County’s property-tax contribution should be about 18 percent higher than last year, as real estate values have risen. In Garfield County, however, the oil and gas industry contributes about 70 percent of that county’s property taxes, and the college expects revenue to be flat and then decline when CMC starts to feel the impact of recent oil and gas price reductions and production declines. “We know that’s going to hit us in ’16-’17,” English said. Lake County is the only county where CMC will see flat revenues from property taxes, and the college expects contributions to also be flat from Freeport-McMoRan, the parent company of Climax Molybdenum which provides 60 percent of Lake County’s taxes to CMC. State funding should increase by 11 percent this year, and the college’s COO and chief of staff Matt Gianneschi said that is a significant improvement but still much lower than what the college used to receive before the recession. CMC receives no state funding for 300 and 400 level courses, so the main source of revenue for bachelor programs is tuition; reserve funds will be used as needed while those programs grow to be self-sustaining. Because of the anticipated overall higher revenues, Gianneschi said the board of trustees already voted to preserve associate level tuition for in-district students and all bachelor level tuition at their current rates. “We were trying to honor the investments being made by the taxpayers,” he said. In-state tuition rates will increase 6 percent, while out-of-state tuition rates rise 18 percent. Gianneschi said CMC’s overall enrollment numbers are declining, but students are taking more credits and shifting more toward a younger, full-time demographic. With those factors combined, CMC expects net tuition revenue to rise by $800,000 this year. The college serves roughly 20,000 students a year, including non-credit courses. In Summit County, roughly 1,245 students took at least one class at the Breckenridge building and 775 people took at least one at the Dillon location in 2014-15. CMC expects those enrollment numbers to go up slightly next year. On the expenses side, the college plans to give its roughly 400 full-time and hundreds of part-time and seasonal employees a 2.5 percent raise to reflect inflation. Roughly 36 full-time employees and 90 to 140 part-time or seasonal employees now work for CMC in Summit County, and two new instructors and a counselor will be added next year. CMC is moving to a performance-based evaluation system, and employees may be eligible for merit-based bonuses in the middle of the year. The college also will absorb a 6-percent increase in health-benefits costs without raising employee premiums. Gianneschi said, based on popular demand, CMC will increase its healthy-lifestyles benefit — which provides employees with $125 to use on gym memberships, recreation purchases and other wellness-related expenses — to a yet undetermined amount. Employees rated tuition assistance for graduate school as their second-favorite benefit in recent surveys and discussions. The system recently finished a building at the Steamboat Springs campus, and no major capital projects are in this year’s budget while CMC works on its next 10-year capital plan. Housing is often not affordable or available near CMC’s campuses, English said, and the college is considering partnerships with local governments and the effects of new facilities. The college should have recommendations from an independent study in the fall. At the Breckenridge campus, Gianneschi said plans to build a greenhouse were put on hold after CMC learned costs would be higher than anticipated. Anyone who wants to become more involved with CMC operations should know several positions on the board of trustees will be up for election this year, including the Summit County seat now held by Robert Taylor. The college’s draft budget is available at all of the college’s locations and online. To view or download the document, go to http://www.coloradomtn.edu and then choose the pull-down menu for “About,” click on “Board of Trustees” and then “Budget & Audit.” Or go directly to http://coloradomtn.edu/about-cmc/board_of_trustees/budget_audit/.